Addressing competition issues before they become legal problems. Calfee’s antitrust and trade regulation team provides proactive and trusted guidance so that our clients can address potential competition issues before they become legal problems. We regularly represent public and private companies on antitrust matters in every procedural context – before the Federal Trade Commission, U.S. Department of Justice, and in state and federal courts in complex civil and criminal litigation. We give clients practical competition advice that allows them to achieve their business goals while limiting their legal exposure in areas such as distribution, price, and acquisitions. The industries in which we provide antitrust counsel are as diverse as the firm’s client base and have included consumer goods, automotive components, food and beverage, health care, real estate brokerage, software development, supermarkets, electric utilities, industrial coatings, mining, and dairies. We provide counseling and litigation services in the areas of competitor and customer relations, pricing policies, dealer relations, Hart-Scott-Rodino compliance, joint venture/acquisition analysis, advertising and franchising. We also regularly assist clients in developing and implementing antitrust compliance programs. In the context of antitrust law, the question often is not whether conduct is plainly legal or illegal but the degree of risk of liability it may carry. Assessing that risk involves more than just knowledge of the law. It also requires an experienced assessment of how a judge or jury will perceive the conduct, how state and federal antitrust enforcement authorities will view it, and a sensitivity for the particular client’s business objectives. The stakes in antitrust litigation are often are enormous. Substantial resources usually must be brought to bear in prosecution or defense of such claims. At Calfee, we have the resources and the experience necessary to employ these resources efficiently and effectively. Effective antitrust representation also requires a thorough understanding of the specific marketplace in which a business operates. Our knowledge spans a vast range of industries, and we work with clients to ensure we understand their businesses in order to effectively guide them through the antitrust maze to achieve their business goals. 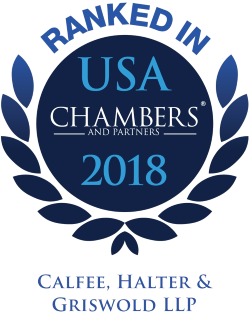 Calfee was selected for inclusion in the 2019 "Best Law Firms" rankings by U.S. News - Best Lawyers in America in Antitrust Litigation and Antitrust Law (Metropolitan Cleveland). Represented a first-tier automotive supplier in multi-district antitrust class action litigation alleging horizontal cartel activity. Through an 11-week trial, successfully defended a local brokerage in an action brought by the world’s largest real estate organization alleging violations of Sherman Act Sections 1 and 2. Defending an incumbent local telephone exchange carrier against a competitor’s claims of monopolization and violation of the Telecommunications Act of 1996. Counseled a nationally recognized manufacturer of luxury consumer goods in restructuring its marketing and distribution systems and cooperative advertising programs and successfully defended the manufacturer in a Justice Department investigation of its programs. Represented a nationally recognized manufacturer and retailer in connection with an industry-wide investigation of competitive effects on retail pricing of certain labeling practices. Successfully defended a leading steel container manufacturer in multi-district, treble-damage, price-fixing class actions and in a parallel federal grand jury investigation based in Chicago. Advised intellectual property clients with respect to possible antitrust implications of field of use restrictions in licensing agreements, as well as the antitrust implications of computer standard setting. Routinely counsel clients on Hart-Scott-Rodino pre-merger notification requirements, prepare and administer filings, and present issues to the FTC and Justice Department enforcement staff in support of the transaction. Represented a regional health care institution in connection with the Federal Trade Commission’s investigation of and efforts to enjoin its acquisition by a competing hospital system.